Are you looking for permanent ways that continue to inspire your congregation on a daily basis? The right sermon can really be transformative for many congregation members, but what will inspire them when they seek prayer during non-service hours? Many people find solace in their church’s stained glass– they’ll find their own personal meanings and perceptions of each stained glass piece aiding in their worship process. Families tend to make it into a tradition for their loved ones when there’s beautiful stained glass features inside of their church. 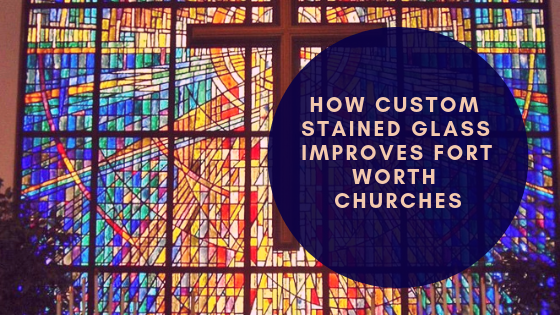 Custom stained glass can offer a multitude of benefits for your Fort Worth church. Custom stained glass lends in the century-old tradition of offering framework and guidance for your congregation. Originally, religious stained glass was used to convey teachings of the Bible to those who were illiterate. In modern day settings, stained glass provides the inspiration numerous people seek during service or individual prayer. Churches can use custom stained glass to continue conveying significant religious messaging while really making an impact on their community and congregation. Stained glass sports a truly wonderful aurora of light that brings that authenticity and authority to any church setting. Custom stained glass is also great functionally due to effective privacy properties. Keep your congregation private and out of sight without eliminating natural sunlight. Scottish Stained Glass specializes in custom church stained glass and has worked with churches from across the nation in their efforts to inspire their congregation members. Sit down with one of our lead stained glass artisans to start your design process. We usually complete eight to ten rounds of design revisions prior to coming to a finalized design. For more information regarding custom stained glass, please contact us!